Hello Walking Dead fans!!! Now that the hiatus is over and Season 4 has begun, we can now see how everyone has dealt with the fall of the prison and the loss of their friends. This episode focuses on Rick and Carl and Michonne. All three of them are physically and emotionally spent and the entire episode revolves around them coping with their own feelings towards everything. The last scene of all three reuniting shows the tiny bit of light and happiness in the zombie apocalypse. Michonne is walking outside the prison and cutting down walkers left and right. She acquires two to protect her from the walkers, just like when we first met her. You can tell that she is mentally drained and when she see Hershels head, it really hits home with her what all has happened. She spends the entire episode walking around and reminiscing about her boyfriend and child when the apocalypse first happened. We find out that her boyfriend did not want to go to a camp and that the two walkers we first saw with Michonne were her boyfriend and his friend. Rick and Carl are walking along a road with Carl in the lead. Rick was hurt in the prison fall and he can barely keep up with Carl. Carl is a man on a mission. He is angry at what happened and is ready to get somewhere. They hit up a gas station for food and Carl assets his authority on how he can take care of himself. 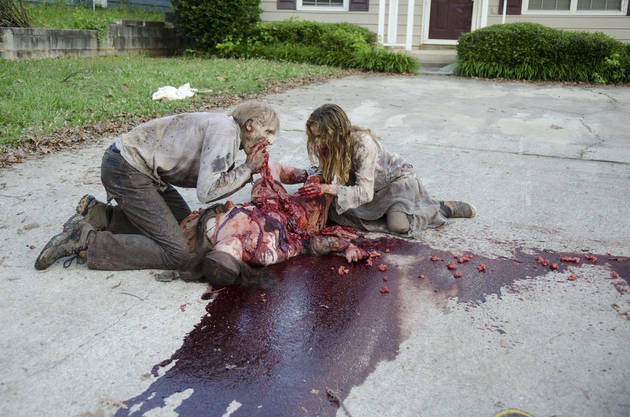 Rick tries to kill a walker with an ax and Carl shoots it in the head. 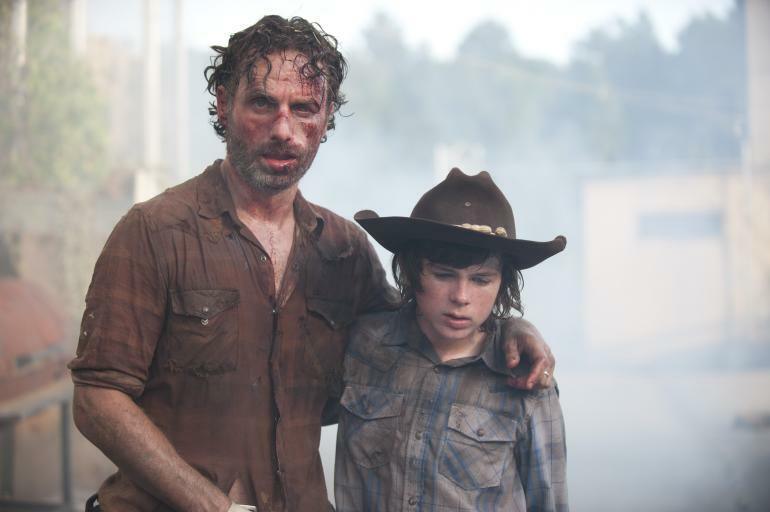 You are seeing Carl try to take care of himself and snub out Rick. Carl is angry and bitter at everything. They eventually come to a neighborhood with a vacant house and hunker down for the night. Carl thinks he can make it out on his own and pops off to Rick every chance he gets. Rick passes out on a couch and Carl soon finds out that he can’t. He lures two walkers way from the house and gets a little cocky. 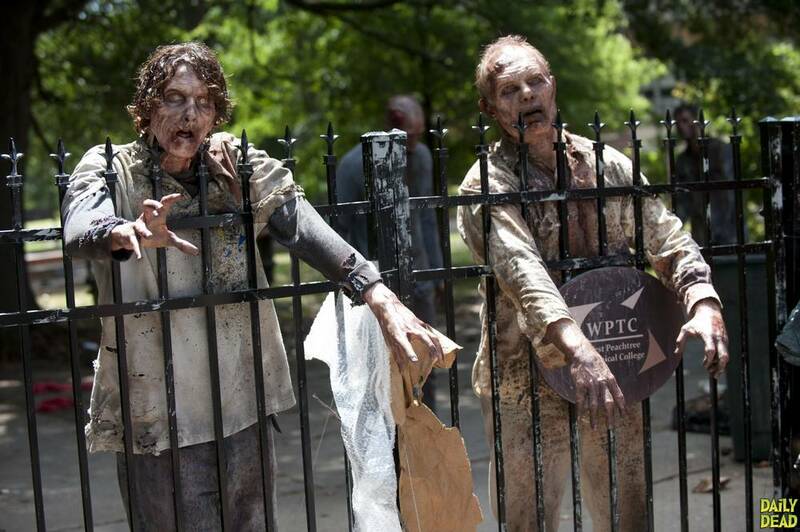 A walker sneaks up behind him and he almost becomes their lunch. After throwing up his breakfast and realizes that the gunshots did not attract more walkers, he goes back to the house and tells off sleeping Rick. Carl blames Rick for Shane, Judith, his mom and everything else. He tells Rick that he is nothing and that he doesn’t need him and “I will be fine if you died”. Carl goes on a food hunt alone and finds a huge can of chocolate pudding. He goes into another house and loses his shoe to a walker, along with running out of bullets. Fighting for his life, he is able to shut the walker in and write on the door that his shoe was lost, not him. He celebrates his victory sitting on the roof and eating some pudding. Michonne finally has her fill of walking with the dead and reminiscing about her life so she cuts down all the walkers around her, including the two that were her protectors. It was a pretty badass scene. Michonne has now become my favorite character due to her resilience to everything . She’s way better than Andrea. I was hoping that Michonne would go a little crazy and cut down a whole army of them, but the 20ish amount was just right for her. She eventually gets to the gas station that Rick and Carl had been at and has a moment. She has now come back from the mental brink. Nighttime has come and Carl is back at the house. Rick falls of the couch and groans. For a moment Carl and everyone who is watching the show, thinks he has died and become a walker. Carls badass attitude slips away and he cries over not being able to kill his own dad. Rick speaks to Carl in his sleep and then passes out again. Carl has now accepted the fact that he is scared and needs Rick. Rick and Carl have a moment the next morning. Rick states that he clung to the prison way of life for everyone. He also tells Carl that he is a man and apologizes. Michonne walks up to the house and cries with happiness when she sees Rick and Carl. She knocks and Rick laughs when he sees her. This season is looking to be very different from the last one. There are multiple characters who think that they are the only ones who survived and are now having to do things on their own. We will see who can still do it alone and who can’t. At this moment, I don’t have any predictions except that more main characters will die. Let me know what you think!! This entry was posted on Monday, February 10th, 2014 at 1:54 pm	and is filed under Comics, News, Television. You can follow any responses to this entry through the RSS 2.0 feed. You can skip to the end and leave a response. Pinging is currently not allowed.